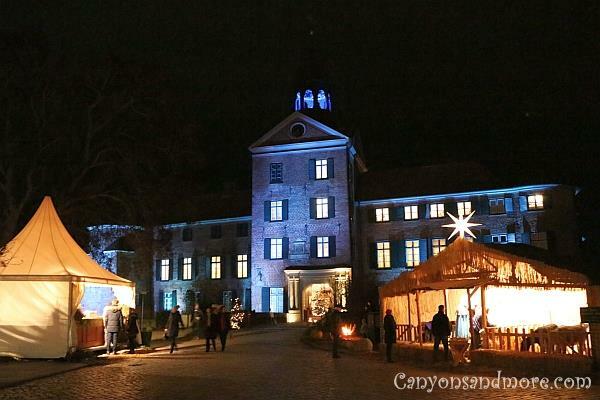 One weekend a year you can visit a Christmas market inside the castle of Eutin, Germany. Eutin (pronounced “Oiteen”). The market has a lovely name, “Werkstatt der Engel”, which means “Angel Workshops”. It costs 5 Euros to enter the castle grounds (2014). Around 100 booths are located either within the castle itself or outside in a smaller and separate building. This Christmas market is a real treat. It gives you a chance to see the inside of the castle in a different light and enjoy a historical atmosphere while browsing at the stalls and tables offering handcrafted items for the holiday and for the home and garden. You can also purchase food and drink such as cheese, herbs, wine, marmelade and selected meat products from local farms and businesses. These make great gifts for someone who enjoys regional specialties. 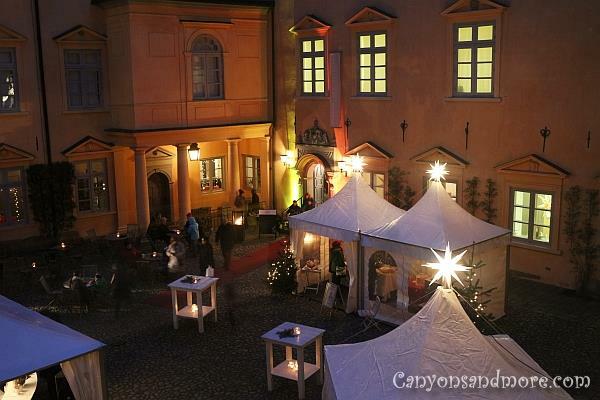 At the castle courtyard there are tents set up offering warm drinks such as mulled wine and food to keep you cozy. The tables are minimalistically decorated with candles and greenery which gives the whole setting an extra charming look. It is a lovely area to meet up with friends and enjoy the Christmas music playing in the background. 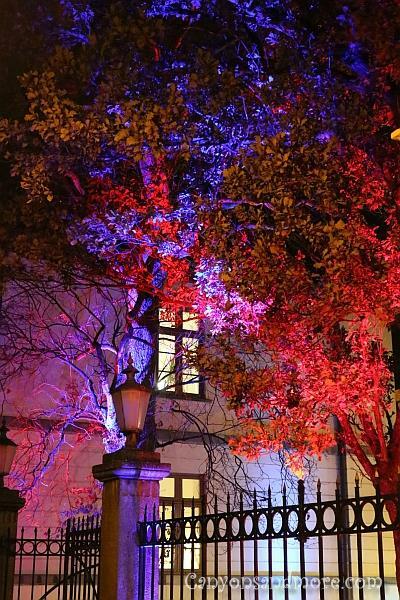 After you leave the castle to approach the second building, where more Christmas market stalls can be found, turn around first to look back at the castle and witness it being illuminated in bold colors of red, blue and purple. It is an impressive sight. 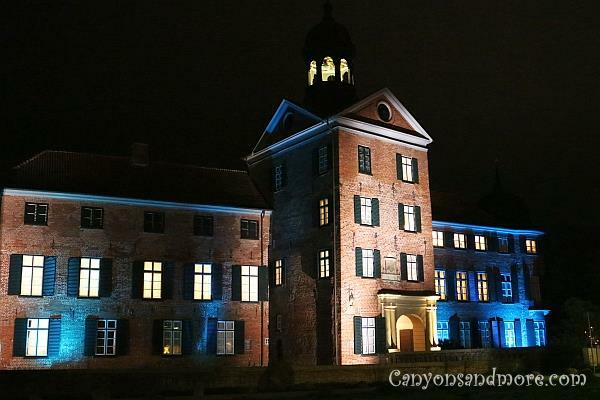 The image above shows you the castle of Eutin and how it is illuminated during the Christmas season. 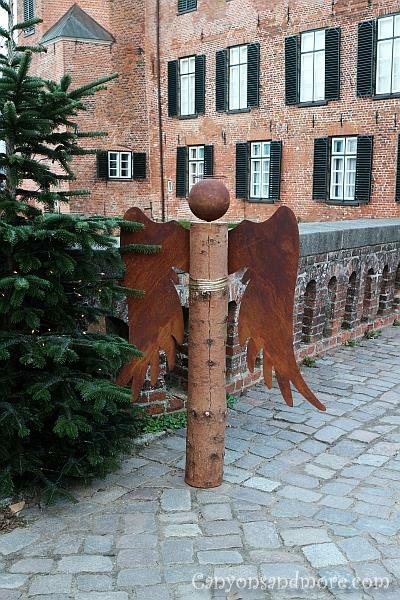 Wooden angels greet you at the castle entrance. The Castle at Eutin Germany - At night different colors of lights illuminate the outside castle walls to give it a festive look during the holidays. A manger with live animals and Mary holding the baby can be viewed. While you are at this market, beautiful angels walk around passing out a card with the story of Christmas written on it. Tents and tables set up at the courtyard of the castle. 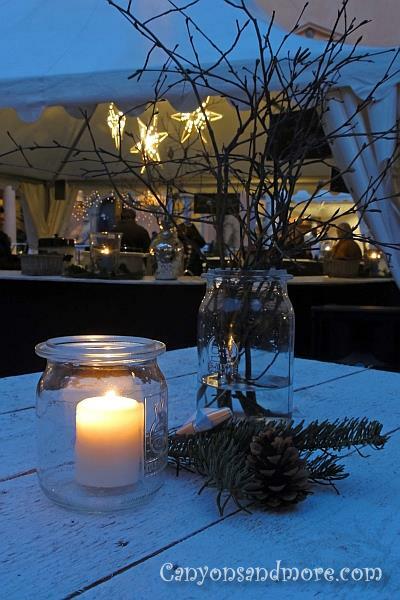 There are tables at the castle courtyard to stand at and enjoy the atmosphere with a mug of warm mulled wine and a slice of freshly made “Elsässer Flammkuchen”. That is not a German specialty but is French and tastes really delish. The trees just outside the castle grounds on the way back to the town of Eutin are also lit up for the holidays. 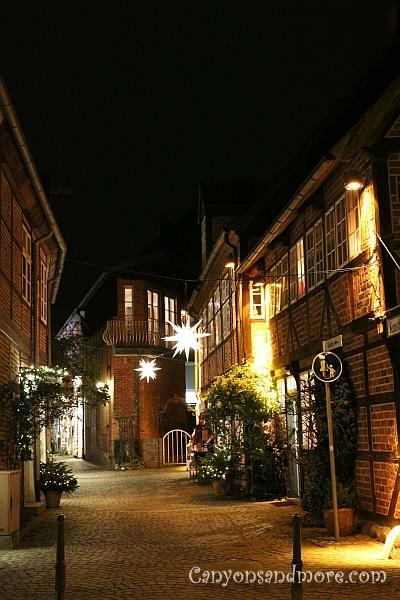 The town of Eutin is decorated very pretty during December. It is worth taking a walk through the charming alleys located near the church. This street is called “Twiete” and can be found between the town square and the castle.